Tastes and cravings are learned in the body and in the brain but influenced mostly by cultural eating practices. While American children learn to love hamburgers, children in China or India learn to love other foods. Here are some time-tested ways to shape young tastes from birth onward. Almost everyone now knows that human milk is the gold standard for infant nutrition. In fact, the positive effects of breastfeeding on adult health is the prime example of how early metabolic programming can protect against adult diseases such as diabetes and high blood pressure. You can lower the incidence of just about every disease by breastfeeding. And the effect is does related: the longer and more exclusively you breastfeed your children, the greater the health benefits. Research has traced some of these health-promoting effects to the fact that breastfed children grow up with lower and more stable insulin levels. Growing up with too high and unstable insulin levels in the bloodstream produces an unfavorable biological environment, so the body and brain cannot grow optimally. Other benefits of breast milk include its heart-healthy fats and immune boosters and the gut-friendly quality of human milk protein. Here are some specific ways that breastfeeding can shape young tastes. It promotes a good gut feeling. Breast milk is known as an “easy in, easy-out” food. Its perfect balance of the right kinds of fats, proteins, and carbohydrates makes it easy on the intestines. Breastfed babies begin life associating good gut feelings with eating. They also associate the warmth and comfort of being close to Mom with mealtime. Could there be a better food-mood connection? It provides ideal metabolic programming. Breast milk gives babies the best possible metabolic programming in the first weeks and months of life. The unique brain-building fats in breast milk help infant brains grow to be the best they can be. The many immunological factors in human milk help the baby’s own immune system to develop. It’s interesting to note that breastfeeding during infancy is associated with a lower lifelong risk of many diseases thought to be caused by immune system dysfunction, including juvenile diabetes, multiple sclerosis, and Crohn’s disease. It introduces foods of the culture. Breast milk plays an important part in transmitting taste preferences for different cultures’ cuisines. A mother’s milk actually carries flavors from the foods she eats. Breastfeeding gets babies ready to enjoy the more flavorful foods their families eat. Variations in the taste of the milk from day to day prepare baby for a varied diet in the years ahead. Breastfed babies seem to grow up being better able to decide how much to eat. Studies have shown that children who are breastfed are less likely to be obese in adolescence. Introduce your baby to the flavor of fresh foods right from the start. The less canned formula and jarred food your baby and toddler eats, the better. When toddlers eat fresh food, they learn what real food tastes like in the mouth and feels like in the gut. They learn to enjoy a greater variety of flavors and textures. These early encounters with solid food are a window of opportunity for shaping young tastes. If your baby and toddler eats only freshly prepared, unsalted, and unsweetened foods, your child will prefer these foods and be more likely to reject salty, sugar-sweetened junk foods. It’s as simple as that. Infants and children do have a built-in preference for sweet-tasting foods. Breast milk is naturally sweet, and studies of newborns have demonstrated that babies just a few days old prefer sugar water to plain water. Babies’ inborn preference for sweet food is nature’s way of ensuring that they like to drink the good stuff – their mother’s milk – that helps them grow. Human mild and the healthy fresh foods that older babies enjoy such as bananas and other ripe fruits have a natural sweetness in them that is not overwhelming or artificial. A baby whose favorite foods are Mother’s milk and squishy bananas probably won’t go on to enjoy beverages sweetened with massive amounts of sugar, corn syrup, or artificial sweeteners. These foods will taste sickeningly sweet when compared with the naturally sweetened foods he learned to love early in life. When artificial sweets hit the programmed receptors in the lining of his gut, they trigger an internal biochemical alarm that registers as “yucky.” On the other hand, children who grow up with a steady diet of sweetened, salted, and greasy fast foods don’t register these foods as “yucky” because they have become used to them. One of the most common problems parents of one- to three-year-olds raise during routine checkups is that their child doesn’t eat enough. We believe one of the main reasons parents think their child doesn’t eat enough is that they expect their child to eat three good-sized meals each day. But young children have tiny tummies about the size of their fists. They feel more comfortable grazing on mini-meals throughout the day. Grazing is actually healthier for them. Not only do most kids eat too much junk food, most older kids eat too much — period! This is true of adults as well. “Supersize me,” we say at restaurants. We have come to view large portions as the norm, and this has turned us into a nation of habitual overeaters. There are sensors in the stomach called stretch receptors. When the stomach is filled with a certain volume of food, these receptors signal the brain, “Stop, you’ve eaten enough!” Research on animals suggests that those who eat too much end up with stretched stomachs that wait longer to send the stop signal. A grazer, someone who eats small portions more frequently, gets used to feeling satisfied with less. By offering your child frequent mini-meals throughout the day, you can literally shape the size and portion expectations of your child’s tummy. Your baby or young child’s first foods should be grow foods, which we also like to call “superfoods.” These are the foods you most want your children to eat when they are older, so it’s important that they learn to like them and see them as a part of their everyday diet. Grow foods are fresh foods or packaged foods that have undergone minimal amounts of processing. They are foods you eat as close to their natural state as possible. They do not contain artificial or factory-added ingredients, and they are nutrient dense — they pack a lot of nutrition into a relatively small volume of food. Nutrient-dense foods are different from calorie-dense foods, those that pack a lot of calories into a small volume of food. Studies have shown that children who are habitually fed nutrient-dense foods tend to prefer them and are less likely to overeat than children who are fed a steady diet of nutrient-poor foods. Studies have shown that children tend to develop food preferences and eating habits similar to their mothers’ preferences and habits. If you present nutritious foods as the norm (“This is what we eat”) and eat them yourself, your children will eat them, too. It’s as simple as that. It is also important to keep your preschool and school-age children from exposure to junk food and advertisements for junk food. 7. Shape Young Tastes, Don’t Control Them! Studies have shown that rigidly restricting children’s access to certain foods focuses more attention on these foods and increases children’s desire to eat them. Parents who try to control their children’s eating habits end up with kids who are more likely to overeat and to eat the wrong kinds of foods. Also, children who are raised in families with highly controlling and restrictive attitudes toward eating tend to have a higher level of dissatisfaction with their bodies. 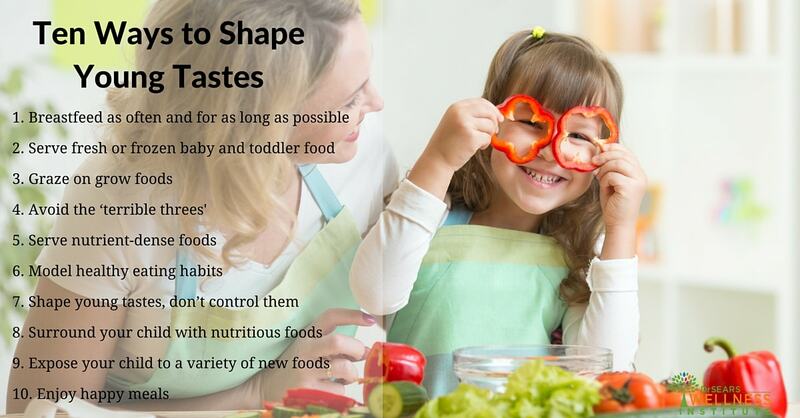 Instead, think in terms of shaping your child’s food preferences. “Shaping” means providing your child with opportunities to make wise choices, and directing and redirecting behavior in ways that help your child learn to be in charge of himself. It’s good discipline, applied to food. Shaping is like gardening. You plant the seed, and while you can’t control how fast the plant grows or when it blooms, you can pull the weeds around it and water it and prune it to help it grow more beautifully. Don’t coerce your children into eating or penalize them for not eating. Don’t make threats such as “You must eat your vegetables or you can’t watch TV.” Long-term studies have shown that this is a for sure way to keep your child from liking vegetables. It’s okay, though, to set some priorities: “Grow foods before fun foods!” Just make sure there’s a tried-and-true favorite grow food on the table so that your child is guaranteed to enjoy eating at least one grow food on the way to a healthy dessert. What’s in your pantry? Studies show that preschool-age children are more likely to eat the foods that are most accessible. When children see a bowl of fruit or a platter of raw vegetables sitting on the table as snack food, this is what they will eat. They won’t go looking in the pantry for junk food. (This strategy works on moms and dads, too.) Restock your pantry with the foods you want them to like. These will become their familiar foods, or “family foods,” the ones that are the norm for your family. One reason fast-food restaurants and junk-food snacks are so popular is that they are very accessible — no chopping, no cooking, no dishes to wash. Just place your order at the drive-through window, or pop open the plastic wrapper. Reminders that these foods are available can be found almost everywhere. Tastes are shaped not only in mouths and guts but also in little eyes. Make sure your kids see healthy food when they walk into your kitchen. We often hear parents complain, “My child just won’t try new foods.” Food researchers believe that an aversion to trying new foods is a built-in safety mechanism. Back when food was hunted or gathered from the fields and forests, it was smart to be cautious about trying new foods. Some could be poisonous – most likely the ones that were not sweet and that had a funny taste. Familiar foods, the ones the family ate all the time, were the safest. Experts in infant feeding and development believe that this innate fear is what causes a toddler to go through a stage of finicky or picky eating. Studies show that new foods are most likely to be accepted between two and three years of age. This is why it’s important to introduce a variety of grow foods during that window of opportunity in the early years. Begin with small amounts, such as 1 or 2 teaspoons. That way if your child doesn’t like the new food, no one gets frustrated and you don’t worry about wasting good food. Make hunger work for you. Children are most likely to accept new foods when they are especially hungry. Try offering new foods at times when your child is most hungry, such as at a midafternoon snack. A new food can be a fun novelty at snacktime. At mealtime, when other choices are available, a child may be less likely to try something new. Be sneaky. Hide a new food in a tried-and-true favorite food. Use a larger amount of the favorite food (e.g., four parts familiar food to one part new food), and each time you serve this combination, gradually increase the proportion of the new food. Play copycat to shape young tastes. When you eat something that you are trying to get your child to like, let your child see you eat it with gusto. Children like to copy their parents, and they’re curious when it seems they might be missing out on something fun. If there’s something you want your child to try, eat it right in front of him without actually offering it to him. He may try the new food simply because you are eating it. Of course, you may have to fake it if you want your child to learn to like something you don’t enjoy. Parents who want to shape their children’s tastes toward healthy food often find themselves eating better when their kids are around. If a parent says, “No way am I eating that,” the child won’t eat it either. In our family we encourage our children, “Take two bites. If you like it, fine. If you don’t, you don’t have to eat it. You can try it again another time.” If it’s really a no, don’t push it. Introduce the new food with enthusiasm and excitement. Make an appreciative face and say, “Yum, good!” Play show and tell: Name it, show it, describe it, take a bite yourself, and talk about how tasty it is. If you child rejects the food, don’t force the issue. Research shows that children are more likely to accept new foods when they are simply exposed to them rather than forced to eat them. Continue to serve the food, and one day your child may surprise you by asking for it. Be sure to present new foods positively. Children are more likely to try new foods willingly when the atmosphere around the table is happy and positive. Children are more likely to eat foods that they have helped to prepare. If they’ve invested a lot of time and energy in helping to make the meal, they are going to want to sample their handiwork. They may even try the new food during the preparation and enjoy it. Invite other children to your home for a meal – kids who you know eat a variety of foods that you want your child to learn to enjoy. When children see other kids, especially their friends or slightly older kids whom they look up to, eating a new food, they are more likely to try it. Eating is supposed to be pleasurable. The more friendly the atmosphere around the table, the more likely your children are to try new foods prepared in different ways, and also to eat appropriate amounts – not too little and not too much. “My kids just won’t eat healthy food,” you may complain. What good is all this nutritional advice if your kids won’t eat what you serve? For those of you with infants less than one year of age, following our advice will be a “piece of cake.” Just get them on the right track from the start (which also means getting yourselves on this same train), and they’ll grow up eating healthy.